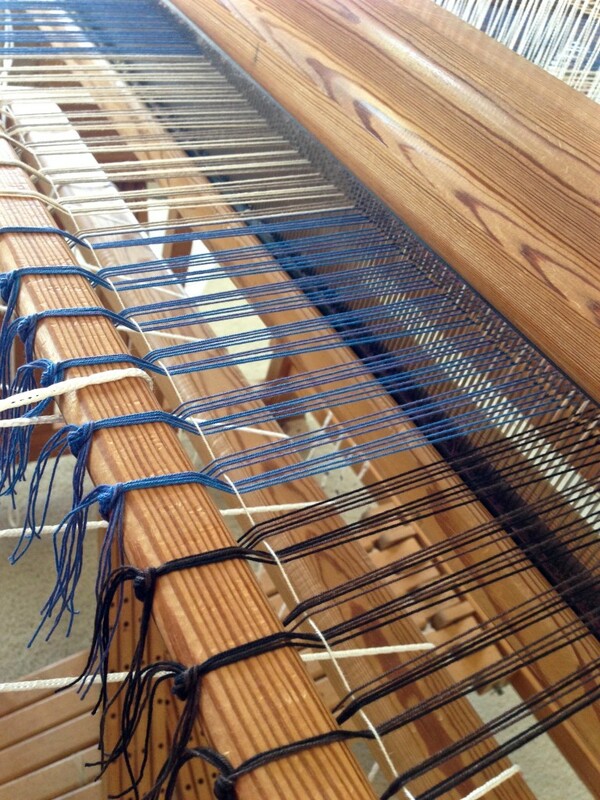 I normally pin a measuring ribbon to the cloth being woven, moving the pins as I advance the warp. This rug is different. I am using a graph paper sketch; and beside each block on the sketch I have written the number of inches to weave. The tape measure that hangs at the end of my weaving bench makes it easy to follow the plan, measuring frequently as I go. This requires mindfulness as I weave, paying attention to the pattern. Two cotton batik prints are used for the first section of blocks in this double binding rag rug. 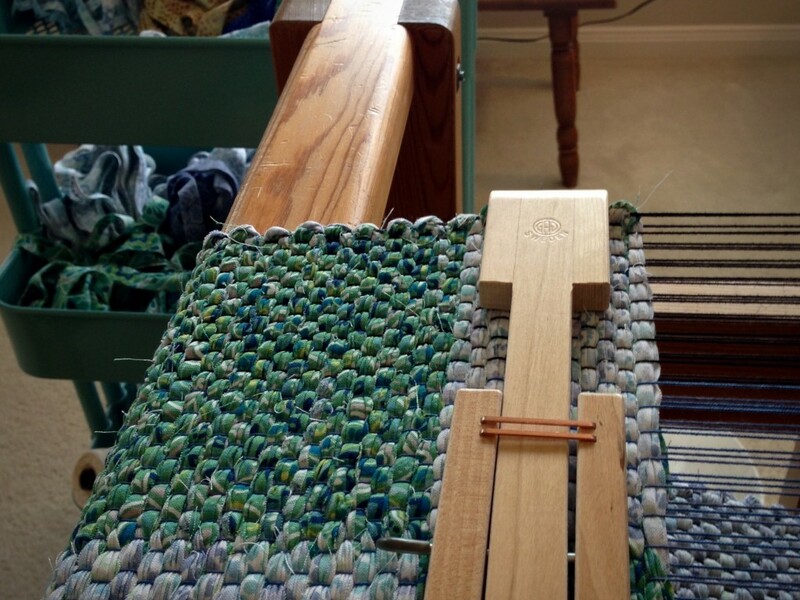 The graph paper pattern hangs with the weaving draft in a plastic page holder on the end of the loom for quick reference. Tape measure hangs on the right end of the weaving bench. This tape measure records inches and centimeters. I use both imperial and metric units, depending on what I am measuring. The Maker of heaven and earth is mindful of you. Cherishes you as his favorite. I know that seems incredible; but as a weaver, I understand it. When you create, you care about the process and the results. As the ones created, we find ourselves in his story. The living Creator God invites us to himself. So, we come to his studio to meet the Mastermind behind the marvelous creations. May your hands find favorite things to make. 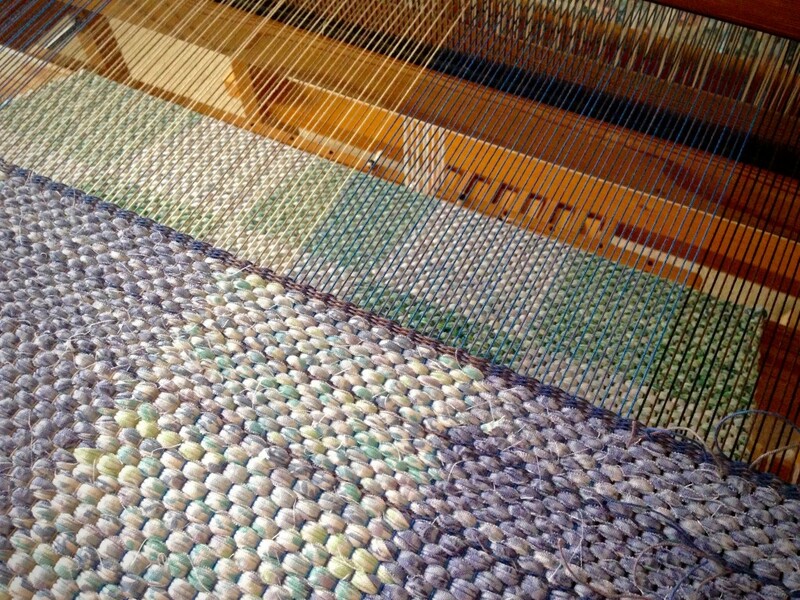 Your rug is beautiful.One of the things I like about weaving is mindfulness. 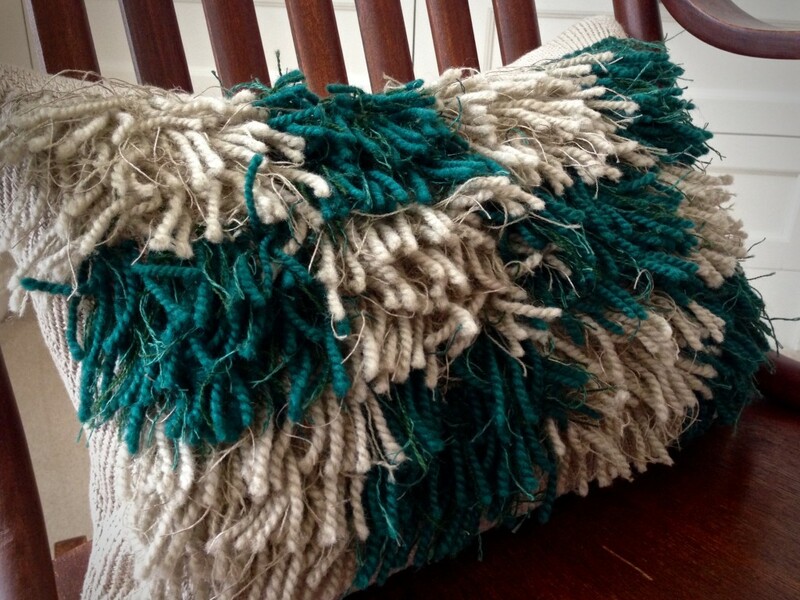 I find that the zen of weaving happens when I am mindful of the design I am weaving. As I concentrate on the pattern, I find myself totally “lost” in the process and nothing else matters. I appreciate hearing your thoughts! 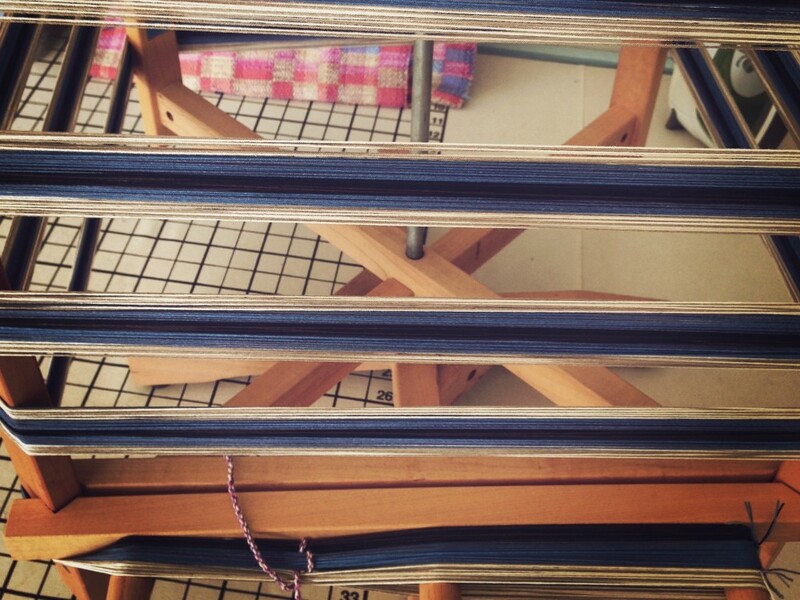 Getting “lost” in the process is one of the things I enjoy about weaving. I needed that. What a beautiful way to describe our relationship with HIM. Even though I live alone I am not alone. HE is with me. I found myself in a ceramic studio for many hours alone to finish a project. No music available in the studio. I asked the LORD for music to encourage and to keep me company through the night.. HE did. Praise and Worship songs ran through my head all night long and into the morning, and not one repeated. I was immersed in the moment and in the design. Peace and creativity flowed. It was HIS creativity and talent. I give HIM all the credit. I imagine the LORD is fashioning me to become who HE wants me to be. . .refining the design/ the plan HE has for me. I am HIS work of art being refined. I’m touched by your story. It’s always fascinating to see how personal the Lord is as He fashions each one of us. Linen dice weave transforms from rigid squares on a stiff open mesh to gently flowing squares on softened cloth, where the threads blossom together to close the mesh. Oh, how the beauty of linen is revealed through washing. Don’t hesitate to pray. Seek God when things are calm. Today is the best time to pray, when things are going well. Oh yes, there may be changes as a result of your prayers, but the changes are all good. May you see the positive changes you hope for. I like the dice weave; so clean! Was the linen really difficult, or have you used it before. I used cottolin once; it seemed too stay quite stiff. Fran, Yes, that’s one thing I like about the dice weave, too – it is clean and uncluttered. 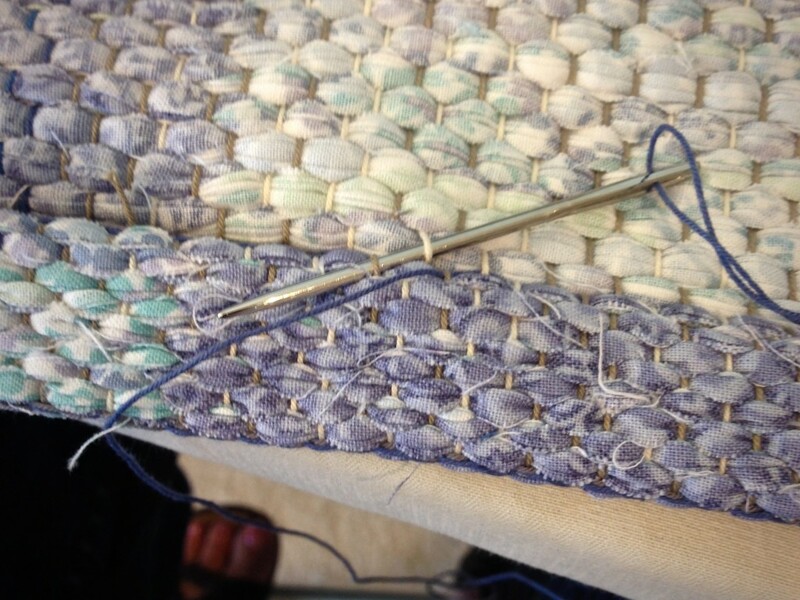 Linen does require some extra attention for weaving, but I wouldn’t say it’s difficult. I have used linen before, and each time it seems to get easier. 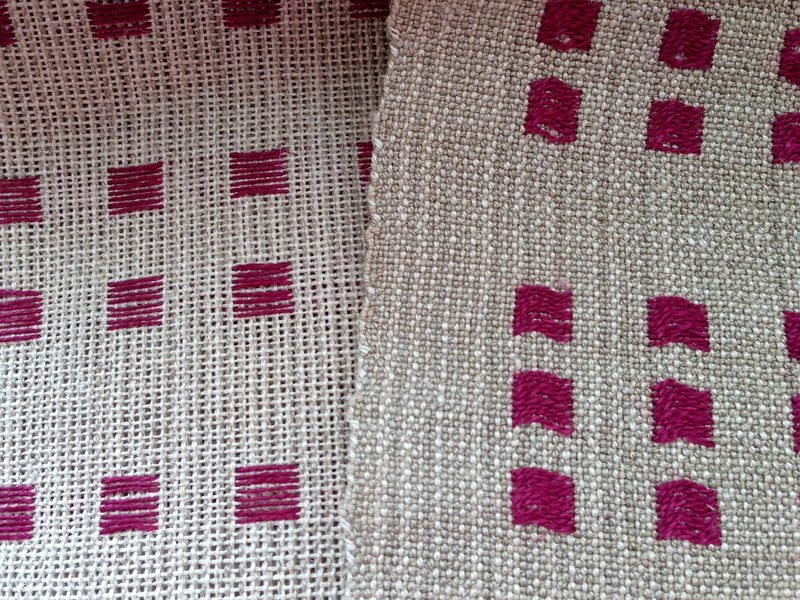 Now, I really enjoy weaving with linen, and I love the results. My cottolin towels get softer and softer with use and repeated laundering. They are my favorite towels. can you share the threading instructions for the dice weave? it’s fascinating. in my mind i’d put on a supplementary warp. it appears you do the dice as wefts. please share. Dice weave is actually a simplified monk’s belt weave. 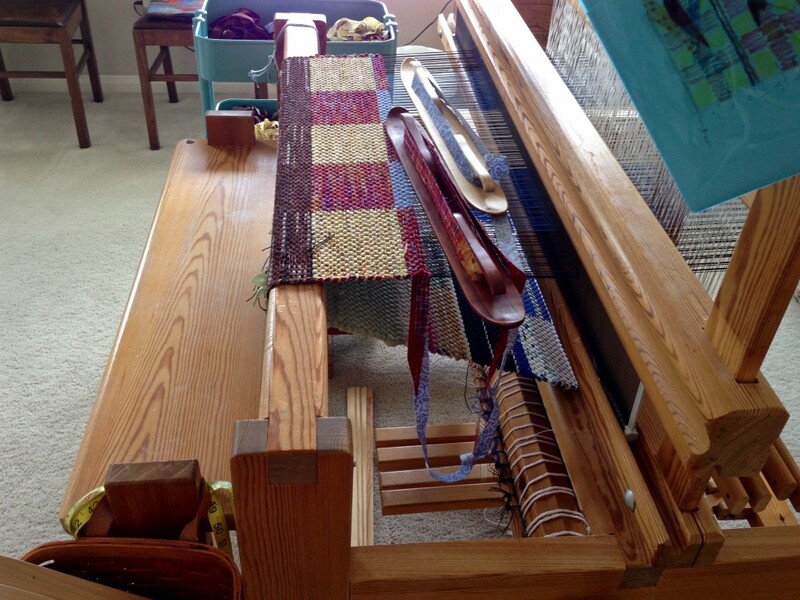 I used the draft in “The Big Book of Weaving,” by Laila Lundell, p.128. 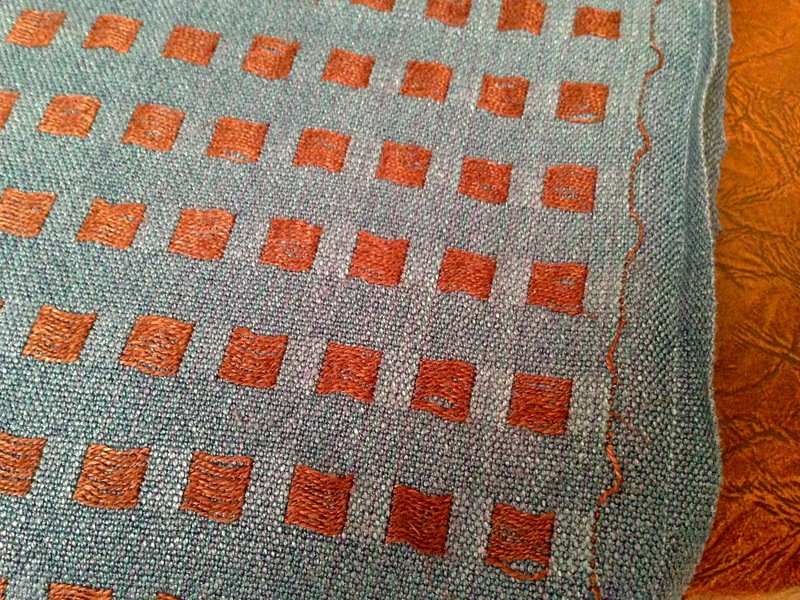 This is pattern weft on a plain weave background, and uses only three treadles–two treadles for the plain weave and one treadle for the pattern. There are two blocks, with block 1 threaded on the first 2 shafts – 1212, and block 2 threaded on the remaining 2 shafts – 3434. It’s that simple. If you look at the draft in the book, you will see how minimal it is. Linda, the floats are a little longer on the back; and the pattern weft does enter and exit through a plain weave shed at the selvedge. Here’s a picture of the back of the blue and brown dice weave that I did previously. It’s not a great picture, but it allows you to see the back. 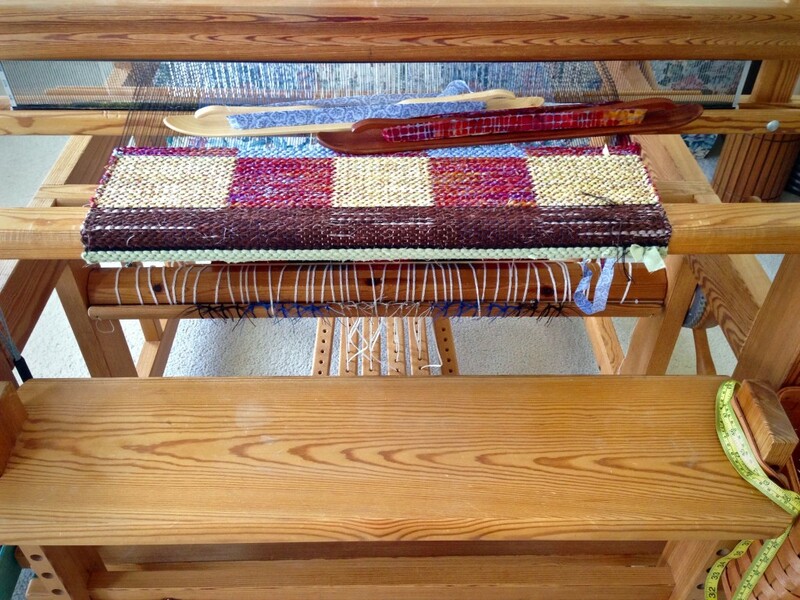 I have another rag rug warp on my Baby loom (Glimåkra 100cm Ideal), playing with the magic of double binding again, this time with four shafts and four treadles. Ten yards / nine meters of warp. I planned an additional twelve inches / 30.5cm between rugs for cutting off and tying back on, so I can cut each rug off as it is finished. 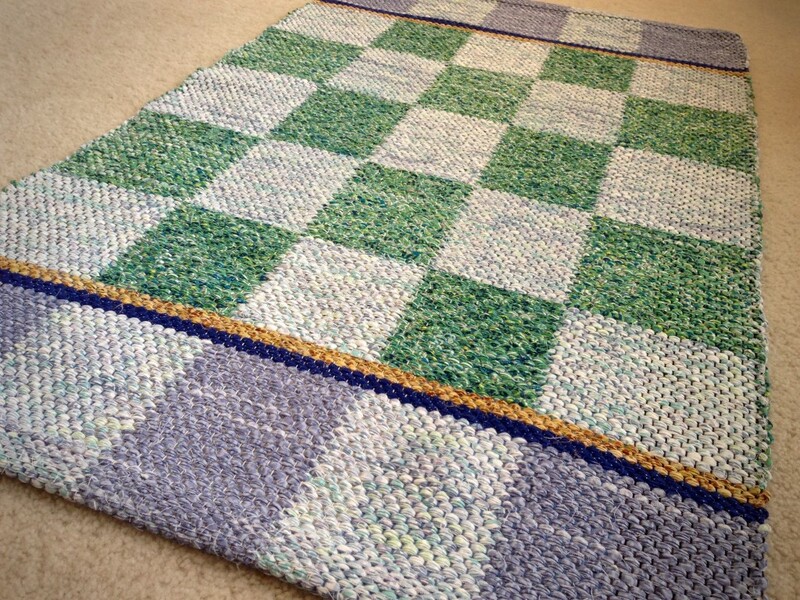 Here is the first rug. Small warping reel is used to measure the ten yards / nine meters of 12/6 cotton rug warp. 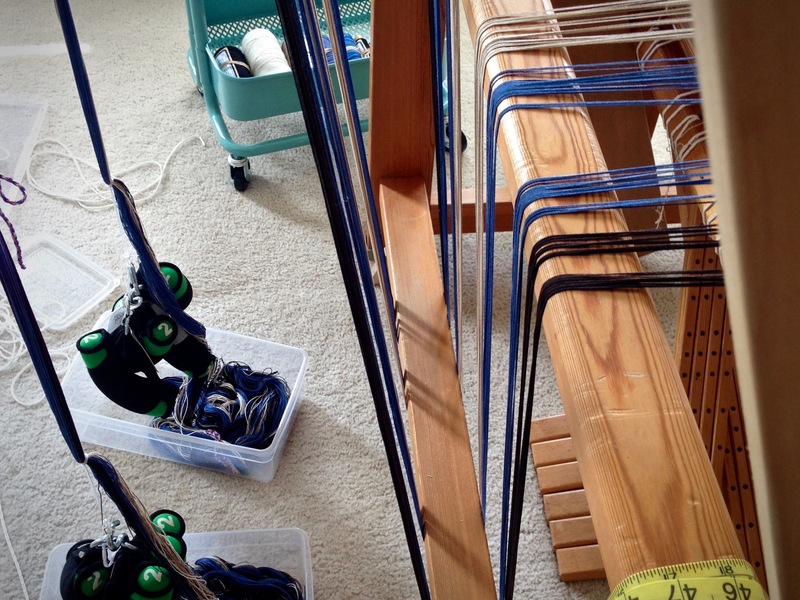 Warp chains are undone and lengthened out over the warping trapeze. Several pounds of walking weights hold the bouts under constant even tension for beaming the warp. All tied on. Ready to weave. 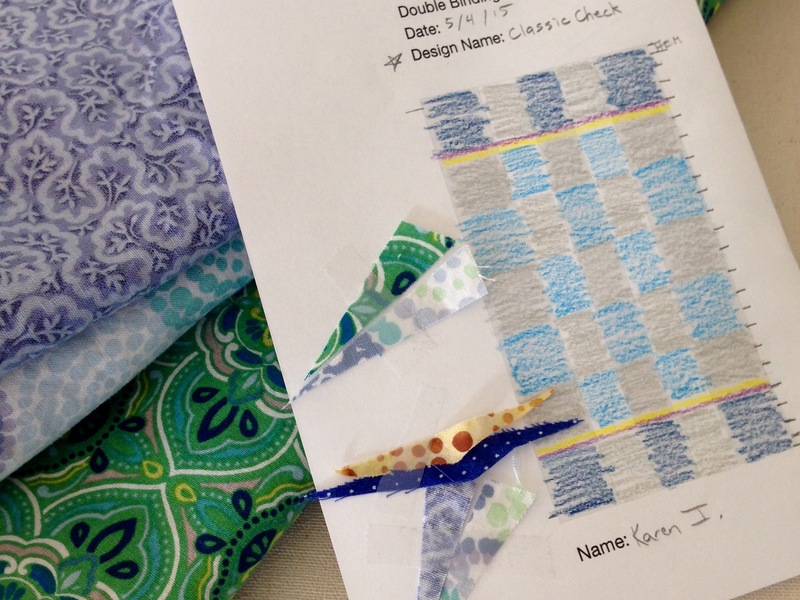 Design concept is created; and fabric colors are chosen. Temple is always in place when I am weaving a rug. I fitted two different temple parts together to get this warp width. Notice the lengthwise gaps between the temple parts…but not a problem. Around the breast beam, and over the knee beam, to wrap around the cloth beam. 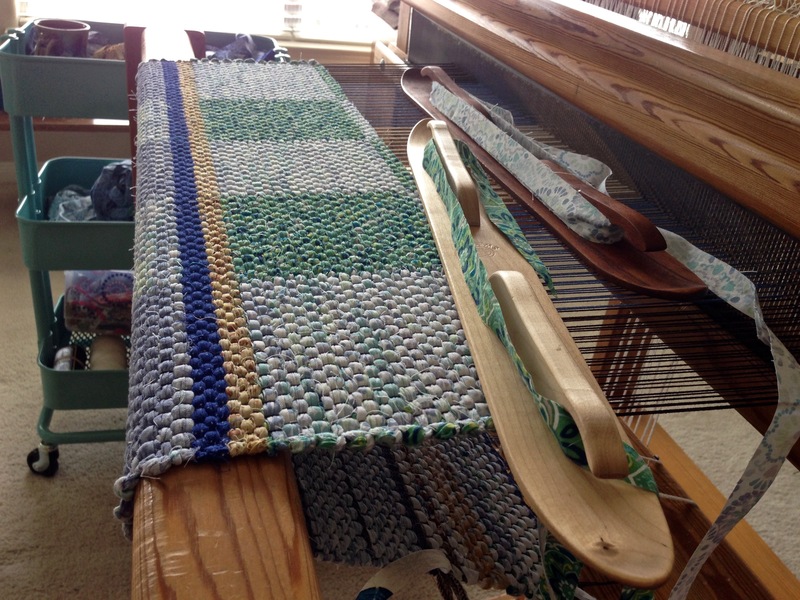 Warping slats are placed between the cloth beam and the rug the first time around to make a smooth surface for the woven rug-cloth. 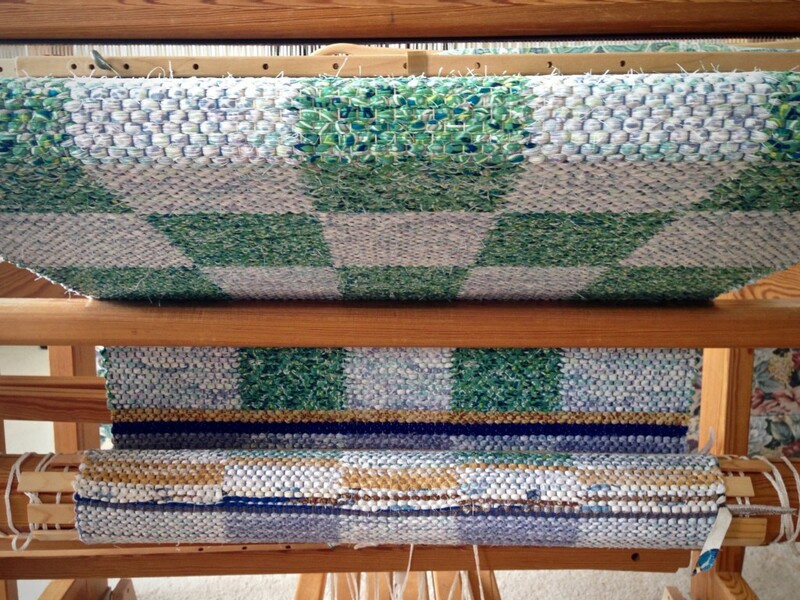 Hem is completed with 12 picks of rug warp. Three inches of scrap fabric header comes next, and then the rug is ready to be cut from the loom. Warp ends have been knotted and trimmed; and hem folded under and pressed. Now, hemming with a needle and rug warp, the last step is almost complete. The only thing left is to sew on my label. Notice the subtle changes in color and depth of color where the warp colors change–purposely not aligned with the block changes. Home sweet home. 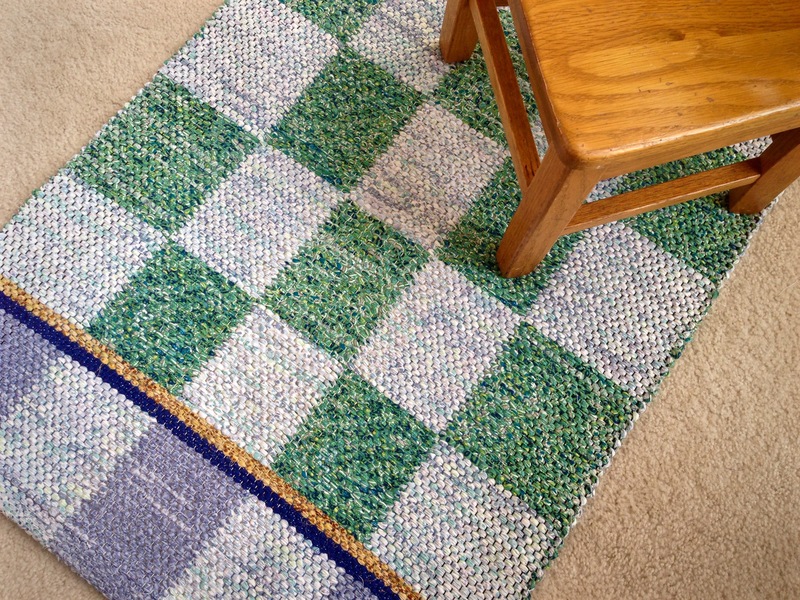 A patterned rag rug makes a house feel like home. May you finish what you started. Most of my favorite books with rag rug patterns and drafts are not in English. But weaving drafts work in any language, and the pictures can inspire many different ideas. I’m always on the lookout for Swedish weaving books, which sometimes have rag rug drafts in them. 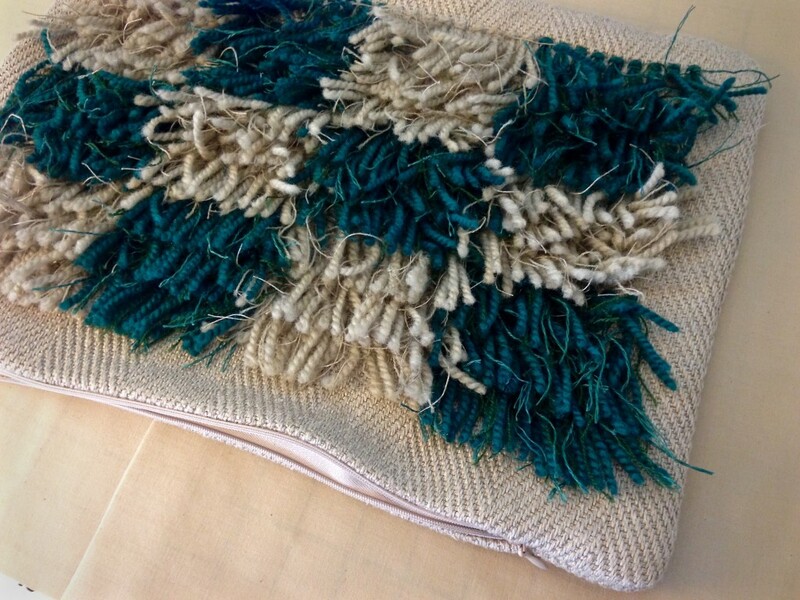 The Big Book of Weaving and Happy Weaving also have one or two good rag rug drafts for starters. Thanks. Those look like good books. Ooh, pretty! It looks like blue skies and fresh green meadow grass, absolutely lovely. Joanna, I’m pleased to hear your description! I may use some of your words to name this rug. Yes, please do give my best wishes to Becky when you see her! 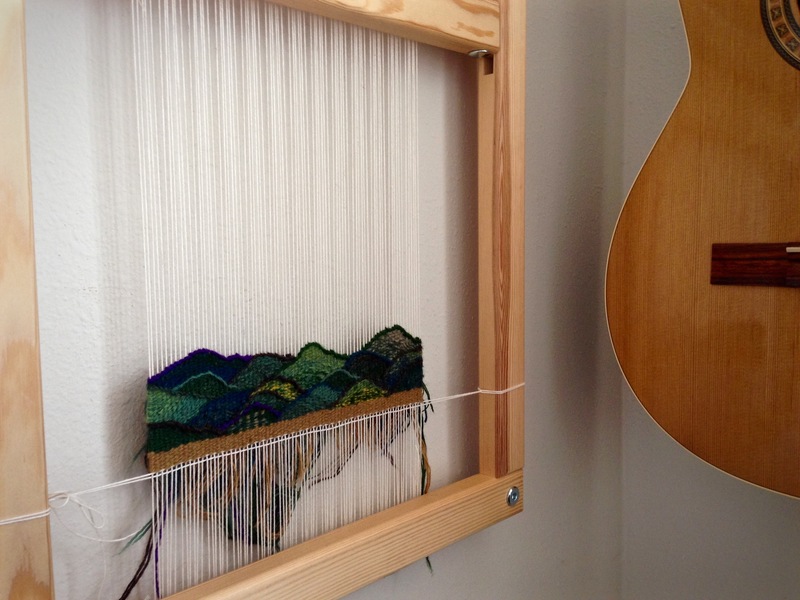 Small tapestry weaving has been added back to my evening routine. Tea and tapestry. This quieting-down practice closes my day. I missed that. I didn’t decide to stop my tapestry ritual; I just drifted away as life got complicated, a little at a time, until I wasn’t doing any tapestry at all. 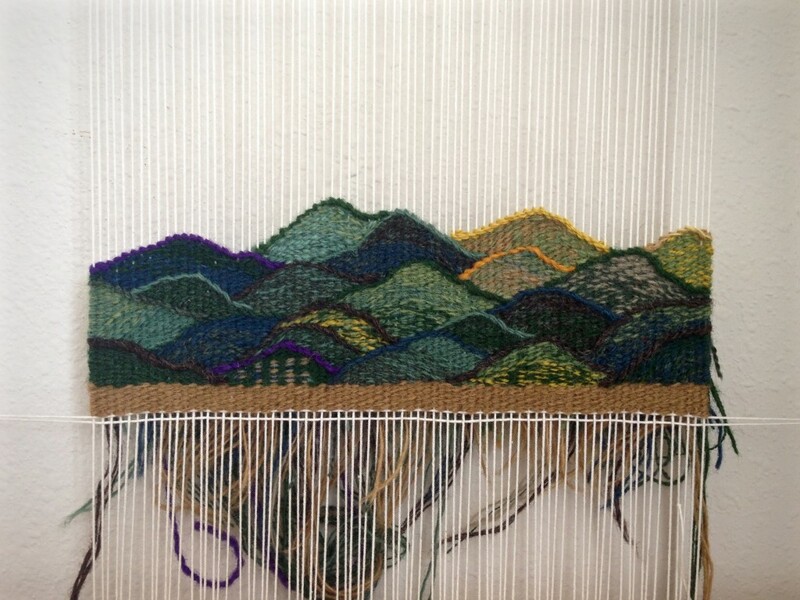 Tapestry diary resumes, adding one little mountain each day. Small tapestry woven from the back. I am weaving little mountains here–one little mountain each day. I let my imagination create scenes that are hidden from view. There are lush valleys between the peaks, and brush-covered hills too short to be seen. In the imaginary mountains, there are innumerable hiding places. I see myself slipping out of sight to sit on a quiet grassy slope next to a sparkling stream. 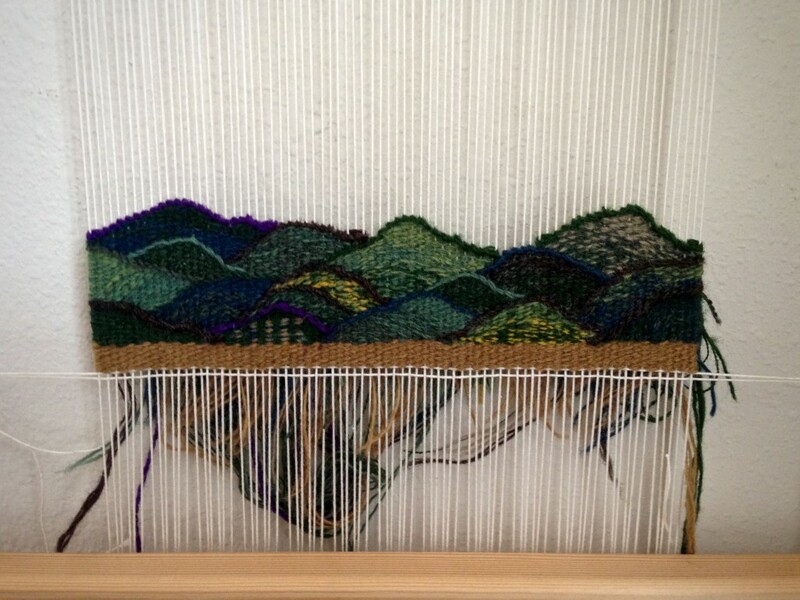 New mountains are woven, creating more imaginary hiding places. 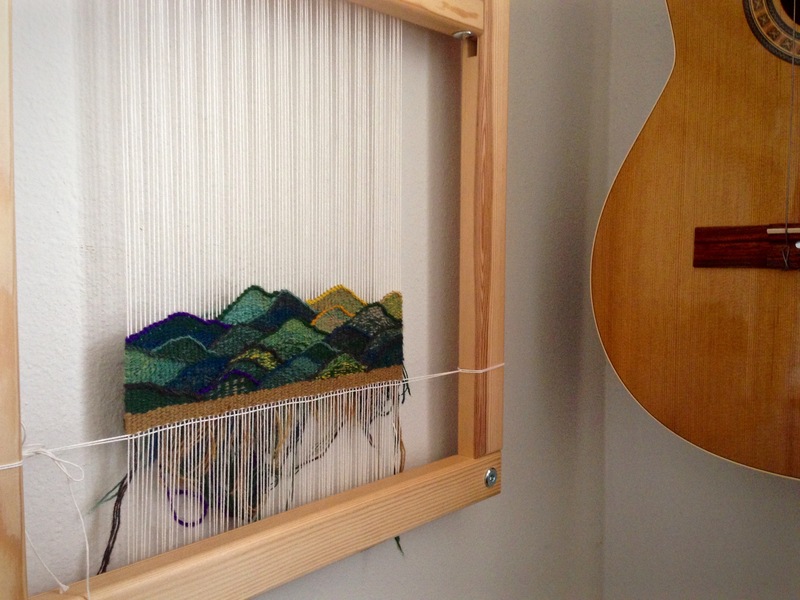 Daily quiet tapestry and tea provides a peaceful close to each day’s adventures. When life gets complicated and overwhelming, there is one thing we need. A safe place to hide. The Lord provides a hiding shelter in his presence to those who come to him. This is the place of safety. From our hiding place, we can see across the distance, make plans for the future, and rest up to continue our journey with strength–strength to cross one mountain at a time. May you find a hiding place when you need it. Karin, thank you so much! I’m glad it had meaning for you. PS I’m computer illiterate, just about kinder garden level so I cannot share my weaving with you. Please know you do bring me joy and inspire me. I won’t see a reply d/t deleting emails quickly. You have to use your imagination with this piece. Fabric is two-sided point twill with rya knots. 8/2 linen for warp and 8/2 linen, doubled, for weft produces a sturdy base fabric for the hand-tied rya knots. 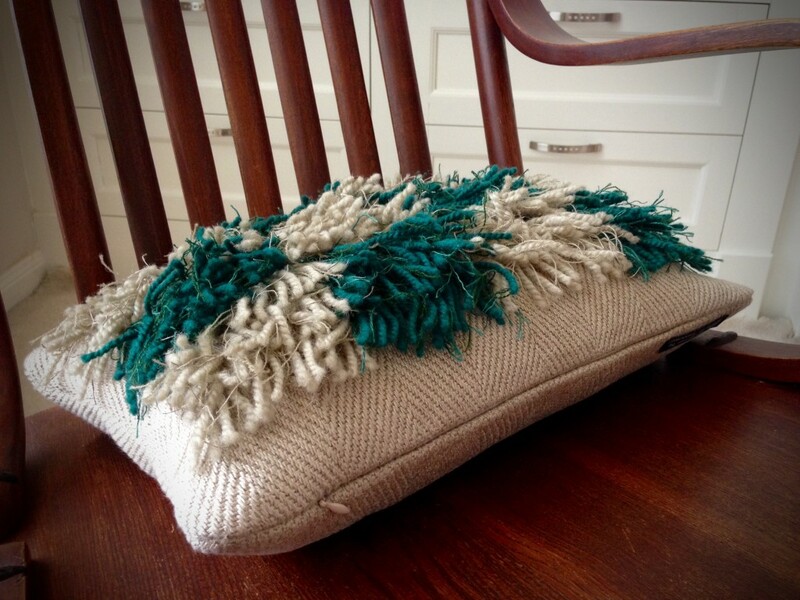 Pillow insert, lightly filled with down-like cluster fiberfill, fits perfectly inside the pillow cover. 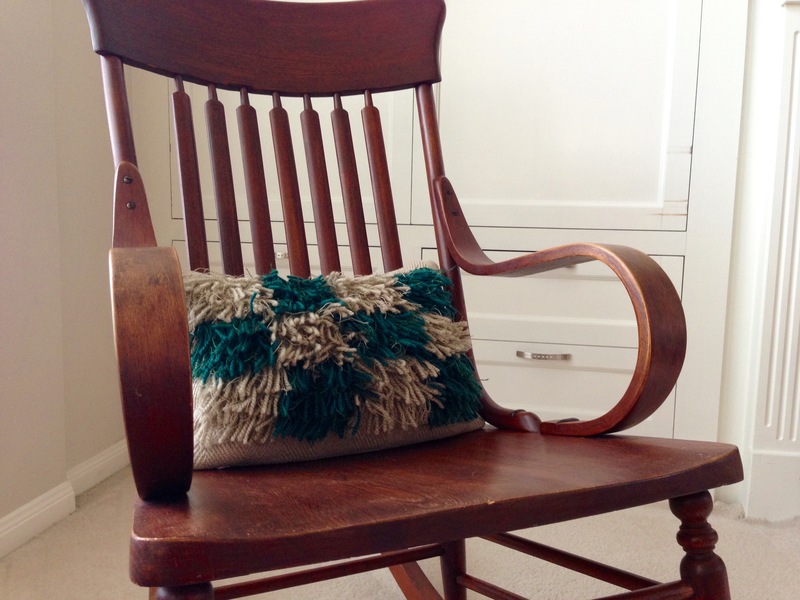 This new rya masterpiece makes a perfect lumbar pillow for the antique rocking chair in my living room. This was my great-grandmother’s chair. One thing I know about my great-grandmother is that she was a praying woman. I love to imagine that she rocked her babies in this chair, praying for them and for her future grand- and great-grand-children. She may have prayed for my life in advance. Each rya knot includes a combination of threads–Åsborya wool, Mora wool, and 16/2 linen. Great-Grandma’s rocking chair. A reminder of love that reaches to the next generation. I want to be more than what others see on the outside. I need the Lord on the inside. I yearn for God to hear me and for me to hear Him. Without that connection, life is hollow. Prayer is a two-way conversation. That ongoing conversation keeps me from being empty. When I am filled, I am at my best. Could that be an answer to my great-grandmother’s prayers? May your life affect future generations. Great Grandma would be so happy! Aw, thanks. That’s sweet of you.